When I found out that The Pioneer Woman was coming to town, and that Marlboro Man and the Drummond Dudes were going to be in the rodeo, I started tweeting my friend Julie to come along. Julie looks fabulous here, and I look, frankly, like my dogs are barking (because they are). Julie and I met over the internets and started following each others tweets and blogs and if I recollect correctly, we bonded somewhere over raw cookie dough. So, since April, I’ve been faithfully praying for my friend. Praying for her surgery, recovery, for her fever to go away, and praying for her on Thursdays when she had her chemo treatments. In between that, commenting on her blog posts and trying to be an encourager from afar. Fast forward to this past Monday. I tweeted Julie and asked her if she and McD were going to come to the rodeo with the Drummond Dudes and/or if she would possibly tag along with Ree for the book signing so I could meet her face. Fast forward to Friday. Julie said they were headed to the rodeo. We were going to go, but tickets had sold out, so Julie said she’d come along with Ree to the book signing. 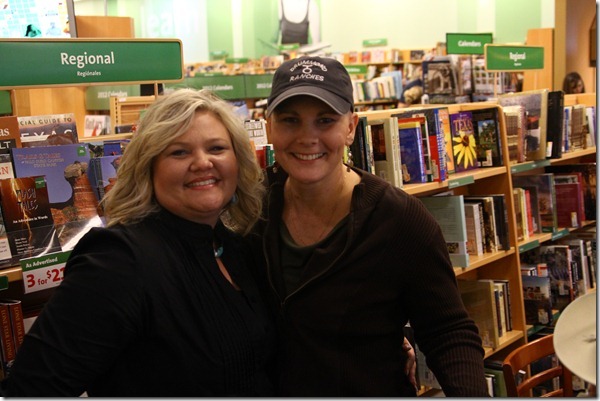 After Ree signed my books, Julie and I gave each other a big hug and snapped this photo. We visited and laughed and visited and laughed and the more we visited, the more we found we had in common (imagine that). I also got to meet her husband, McD. He gave my punks a hard time about liking Chinese food and being duck hunters. Strangely, I like like people who give my punks a bit of a fun-loving hard time. It builds character. Here’s my favorite picture of McD. He’s a hoot and a really good man. Then we decided to meet up to visit at the rodeo the next day which we did and we talked nonstop. Sad that the rodeo was over, I hugged her neck and said goodbye and came home to stir up dinner. All the while, I just kept going over everything in my head. I felt so blessed. I believe there is something powerful that happens when we pray for others, especially when we pray in a prolonged way for someone even if we don’t see them face to face. I believe this weekend, I felt and experienced the full extent of that. To see one of those friendships come to fruition from the internets to a real live person is just about one of the neatest things I’ve ever experienced, and I am blessed. I am just so blessed and thankful that God gave me this. And if you happen to be reading this Julie, I’m so glad you came to Amarillo! I can’t wait for you and McD to come through town again and have dinner with Ol’ Blue Eyes and I. I’ll make sure my punks will smell better too! I promise to keep praying for you. You are now one of the strongest women I know, and I admire your strength so much. I am still chuckling that when I couldn’t find you at the rodeo, you took off your hat for me to find your bald head. You crack me up, and well, I just love ya! And for the rest of you reading this, hop on over to Julie’s blog at http://www.anotherchanceranch.net/ and please add her to your prayer list. This entry was posted in Daily Drivel and tagged book signing. Bookmark the permalink. You are really too kind! You are so stinkin’ sweet! I feel the same way about you! God put you in my life, and I don’t know why but I am so excited that he did! I have to say that the highlight of my day was meeting you! I had a great time at the book signing, but you were the icing on the cake that day! I am so glad we could share some cotton candy on Sunday!! 🙂 One should never eat cotton candy alone!